A local mother of twin girls has recently started an online twin apparel company featuring a variety of t-shirt designs for moms and their twins, from onesies to youth tees. Their logo is made of the number 2’s and all of their critter designs are created with the number 2. 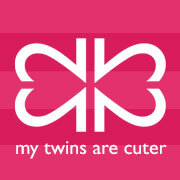 Check it out at www.mytwinsarecuter.com!